Jeff Aquilina, co-owner of Concrete Cuisine, doesn't believe the government should help or hinder food carts. Food trucks are a growing part of the cuisine scene in Michigan and nationwide, but should the government be picking winners and losers among truck owners? A program from the Michigan Economic Development Corp. does just that. The MEDC's "Mobile Cuisine Start-Up Program" dished out $77,775 in grant money to different food truck businesses this summer. The agency selected eight winners out of 65 applicants from food trucks statewide. The grants of up to $10,000 each were awarded to new and existing food truck businesses that "offer easily accessible and unique food options to patrons in public spaces." 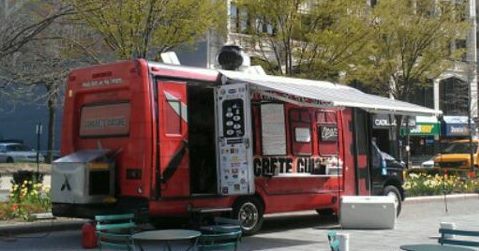 The Concrete Cuisine food truck. However, not everyone agrees with the program. "The government shouldn't give grants to promote any business,” said Mike Berschback, who co-owns the Green Zebra Truck, which operates in the Troy area. "[And] they certainly shouldn't pick individual winners and losers. If one's food truck is a viable business they shouldn't need assistance from the government, and if they do need it to survive then they won't be in operation long." At the same time the state is promoting food trucks, other governmental units are working to limit them. In Detroit, the regulations for food trucks are byzantine, with multiple layers of approvals needed that severely limit what foods can be sold and where trucks can park. Despite resistance from restaurants, food trucks in Grand Rapids began operating on private property in September. Previously, the city only allowed small carts with extremely prohibitive restrictions. Kalamazoo hands out only 10 licenses per year and prevents vendors from selling within 150 feet of a restaurant. East Lansing charges $1,800 per year for food truck licenses and limits them to three areas. Before an eventual overhaul this summer, Traverse City charged $100 per day downtown, made it illegal to park for more than 10 minutes on public property, and required approval from the police chief who evaluated, among other things, "moral character." Last year, Michigan Capitol Confidential broke the story of a 13-year-old Holland boy whose hot dog cart was shut down by the city because of an ordinance that restricts competition with brick-and-mortar restaurants. The national media picked up the story and eventually he was granted a special permit. Cities all over the country have been shutting down food trucks. The Institute For Justice, a public interest law firm, has filed lawsuits across the nation representing vendors. In Chicago, the city made it illegal to cook inside trucks and today prevents them from selling within 200 feet of restaurants. El Paso, Texas, lost a case after forcing vendors to operate 1,000 feet from other businesses and preventing them from stopping to wait for customers. Atlanta tried to smother the industry by handing over all public property vending to a single company; IJ sued and won. The city of Hialeah, Florida, wouldn't allow trucks to operate within 300 feet of brick-and-mortar restaurants and prevented carts from displaying merchandise. "Instead of putting taxpayer money up for grabs in a contest won by a select few, the state government should encourage cities to stop using public funds to enforce protectionist policies that make it difficult for food trucks to operate," said Robert Frommer, an attorney with IJ and co-author of the report, "Food Truck Freedom: How to build better food truck laws in your city." 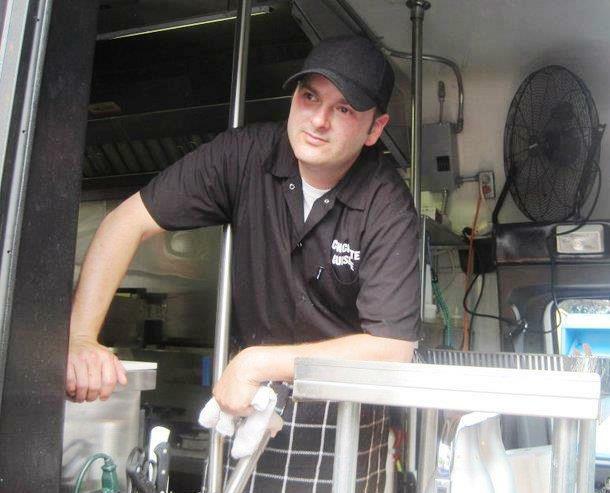 "The government should not be allowed to intervene with our food trucks," said Jeff Aquilina, who co-owns Concrete Cuisine, which operates in Metro Detroit. "This country was built on free enterprise and competition. We should be allowed to compete and not have the government step in in any way that would either impede our progress or give any food truck the upper-hand, whether it be with grants or with easier access and regulations." However, Richard Myrick, editor-in-chief of Mobile Cuisine, a resource website for mobile vendors, said that while he doesn't like government picking sides among different types of businesses, the MEDC program could be a good thing. "If the program is run properly, the government really isn't picking winners and losers," Myrick said. "They are providing funding to small business owners that are the best investments. They will have well thought out concepts and business plans. I'm sure the grant money will help those who are awarded, but at the same time, there are plenty of other means for culinary entrepreneurs to get financing for their startup food trucks." Green Zebra Truck owner Berschback said the only role for government regarding businesses is "making it easier to operate and succeed" by removing red tape. For every event, his company is forced to file a new form with the county at least five days in advance, with many requiring a fax rather than a simple email. "[For the MEDC program], not only is the government picking winners amongst food trucks but it is also using tax revenue from other businesses such as brick-and-mortar restaurants to finance their competitors just because food trucks are popular right now," he said. "While we enjoy the growing popularity of the food truck industry it shouldn't be financed by other businesses and taxpayers." The MEDC defended the program, but said the program will not continue for fiscal year 2014. "The intent of the Mobile Cuisine Startup Program was to assist with community and economic development by increasing pedestrian traffic in downtowns and traditional commercial cores, and bringing vibrancy to underutilized public places," said Katharine Czarnecki, the MEDC's director of community development. "It was also aimed at fostering a sense of place in Michigan communities and supporting small businesses that utilized Michigan products."